IMAGES: Supernatural 10x18 "Book of the Damned"
Via the CW, we’ve got some first look images from Supernatural’s April 15 episode to share. In “Book of the Damned” Charlie (guest star Felicia Day) calls Sam (Jared Padalecki) and Dean (Jensen Ackles) to tell them she found the Book of the Dead which could help remove the Mark of Cain. The Winchesters race to her after she tells them she’s been shot by a man named Jacob Styne (guest star Jeff Branson) who says the book belongs to his family and he won’t rest until he gets it back. Castiel (Misha Collins) and Metatron (guest star Curtis Armstrong) take a road trip to find Castiel’s grace but they hit a couple road bumps along the way. 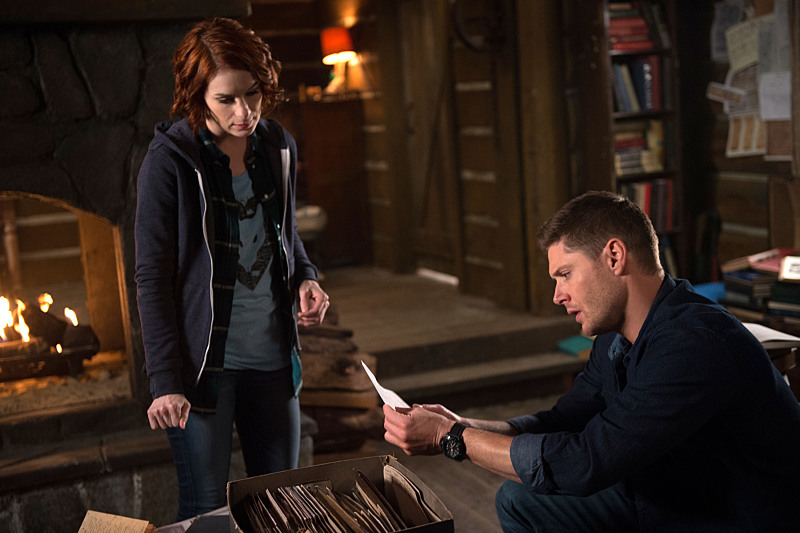 Supernatural -- "Book of the Damned"
Supernatural -- "Book of the Damned" -- Image SN1018B_0239 -- Pictured (L-R): Felicia Day as Charlie and Jensen Ackles as Dean -- Photo: Diyah Pera/The CW -- ÃÂ© 2015 The CW Network, LLC. All Rights Reserved.